The over the top sari is studded with gold, diamonds, emeralds, rubies, platinum, silver, yellow sapphire, blue sapphire, cat’s eye, topaz, pearl and coral. Thirty Chennai weavers took over seven months to create this one piece. Aside from its astronomical cost, the sari is also the world’s first to require 7,440 jacquard hooks to complete. 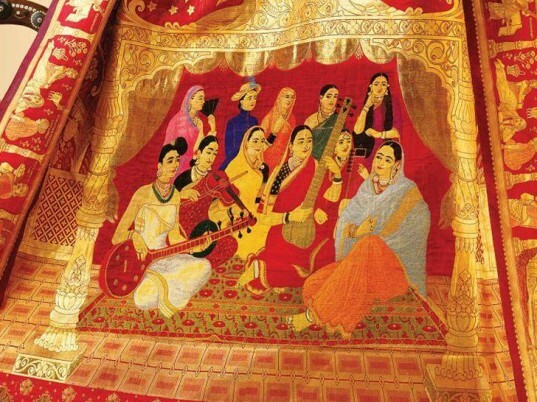 The intricate design shows a group of female musicians, with real precious stones on each figure as in the original painting. Ten more of Varma’s paintings are portrayed in the border around the sari as well. Aside from draining the wearer’s bank account, the jewel encrusted garment takes a toll on the body- weighing in at almost 18 pounds! Each of the baubles were hand woven into the sari, adding even more layers and weight to remain sturdy. Yet despite its glitz and weight, The Chennai Silks actually expects someone to buy the piece, to be worn. In a country where poverty and unskilled labor runs rampant, the funds spent on the sari could surely see better use. 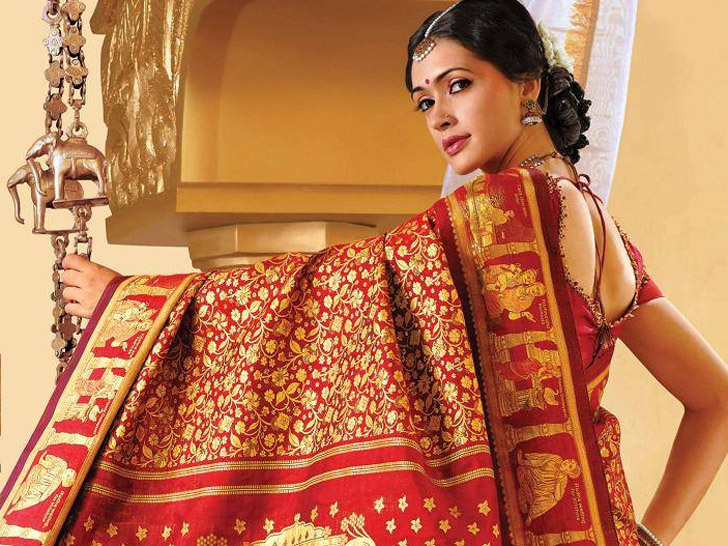 The sari was debuted by South Indian actresses Suhasini Mani Ratnam, Shobhana and Jeeva. Like all true couture the price is staggering, and yet artists and craftspeople are employed in the making and benefit from the exposure. What is more obscene, on person paying this much for a hand crafted work of art, or hundreds of thousands of 'stylesetters' across continents paying $200 for a pair of jeans that cost $20 to make, and that are made under appallling conditions? Just becuase parts of India suffer appalling poverty, does not mean that patronage of the arts should cease. Gandhi would not have liked the gemstones, but he might have liked the weaving, the painting. We owe it to India to not be so simplistic, so judgemental.